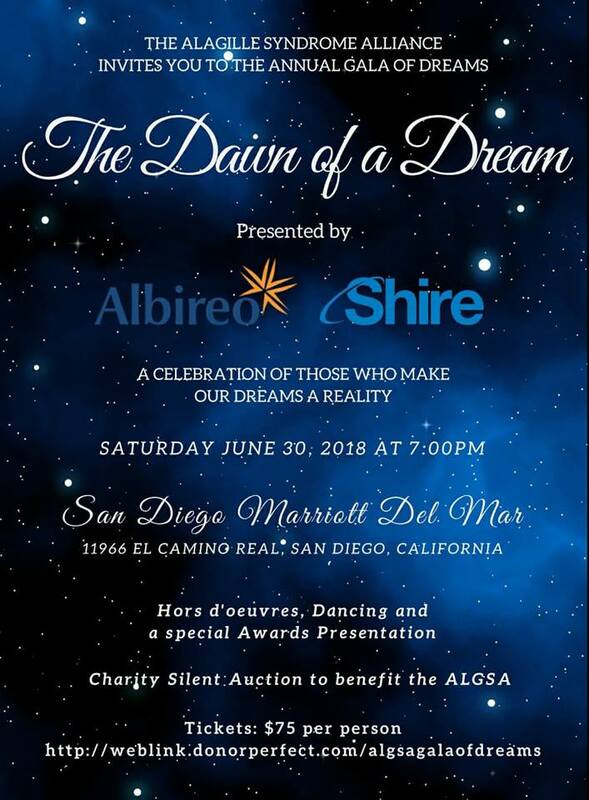 To celebrate raising $12K+ through the RARE Carousel of Possible Dreams for ALGS research at Dr. Duc Dong’s lab at SBP, we’re hosting a Gala of Dreams event in San Diego at the Marriott Del Mar the evening of June 30, 2018. 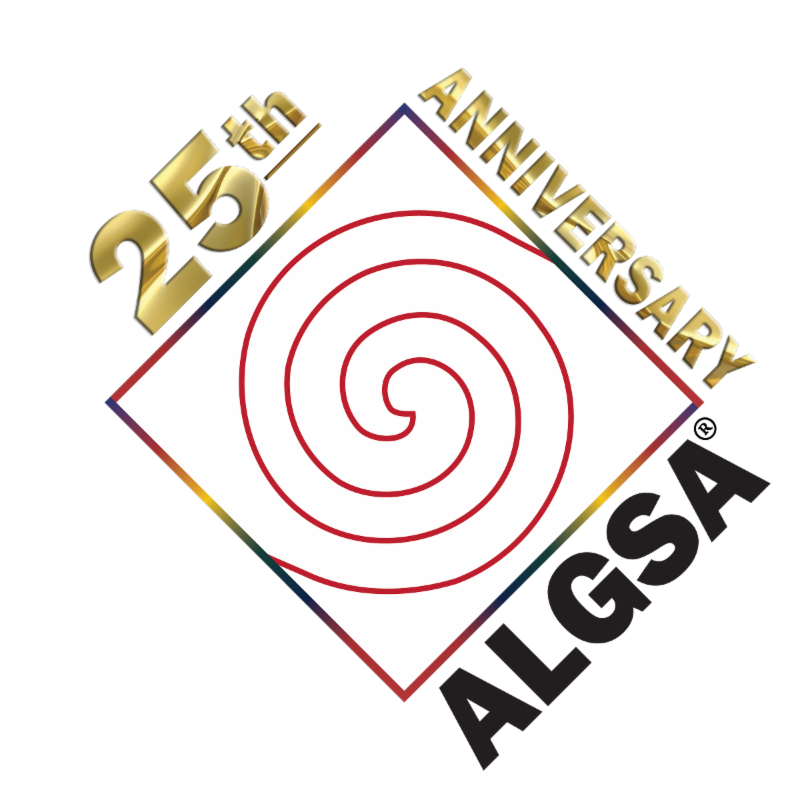 The theme is "The Dawn of a Dream" signifying new advances in ALGS research, our first participation in the RARE Carousel of Possible Dreams campaign, and a celebration of our 25th year in existence. We hope that you’ll join us for this exciting inaugural Gala event for the ALGSA. Individual tickets are $75 and can be purchased HERE. There’s also a reduced room rate at the Marriott Del Mar for out of town participants, available until May 31, 2018, HERE. 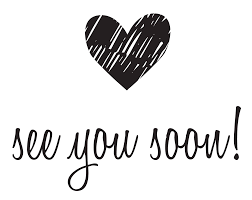 The evening before the Gala, on Friday, June 29, we have a very special VIP opportunity that includes a tour of Dong Lab at 4:00pm followed by an intimate dinner with Dr. Duc Dong, a very small group of sponsors, and ALGSA Founder Cindy Luxhoj. This will be served at Arterra inside the Marriott Del Mar. These special VIP tickets are $600 and will provide you an opportunity to get a deep dive into Dr. Duc Dong’s work to move ALGS science forward as well as an intimate look at partnerships we’re developing to improve treatments and care. 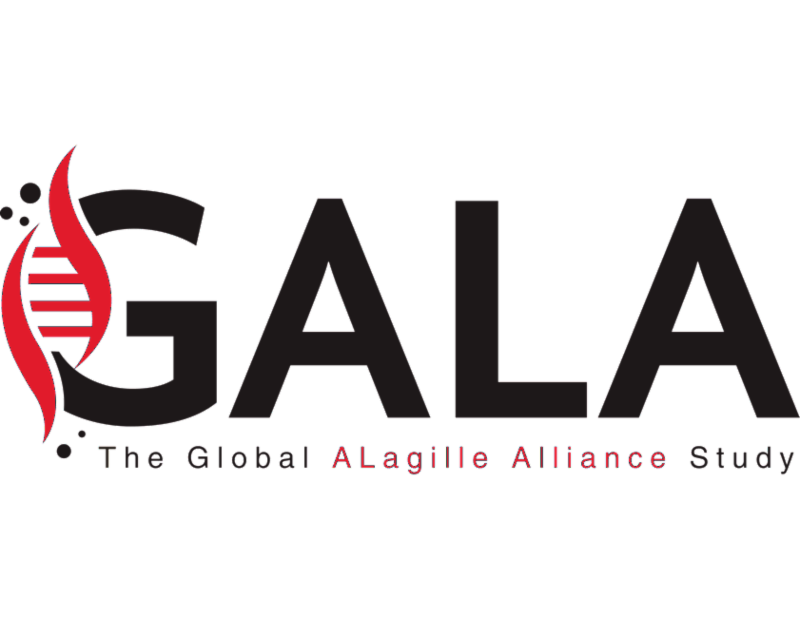 On the research front, we have many new initiatives including funding the Global Alagille Alliance (GALA) study, an international multi-center natural history database to facilitate analysis of a robust cohort of individuals with ALGS. We also are developing the Rare Disease Research Hub (RDRH), an online platform where researchers and patients/families are able to connect and collaborate with one another and, through the synergy of information and data sharing, catalyze advances in ALGS science and discovery. We hope to see you in San Diego at the end of June! It’s going to be a party and I hope we’re able to count you in! 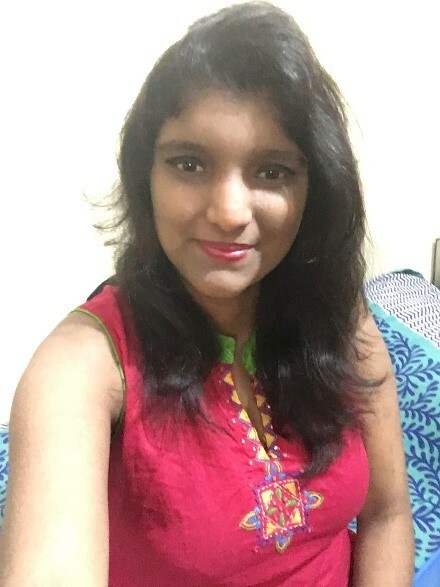 "It's called a RARE DISEASE because you are RARE"
"There's not enough people like you but there's enough that there's a need to address the issues that you're going through", explained Shambhavi Ravishankar, ALGSA board member and alagille patient, while trying to express the difficulties of being rare. Shamy, along with Anna Laurent, ALGSA board member and alagille patient, together were able to describe their feelings on being rare, what scientists working for a cure means to them, and how they see the bigger picture, in an amazing video produced by Sanford Rearch marketing team. "We need research. We need to have someone [to do research], we need money. We need to spread awareness", said Anna. 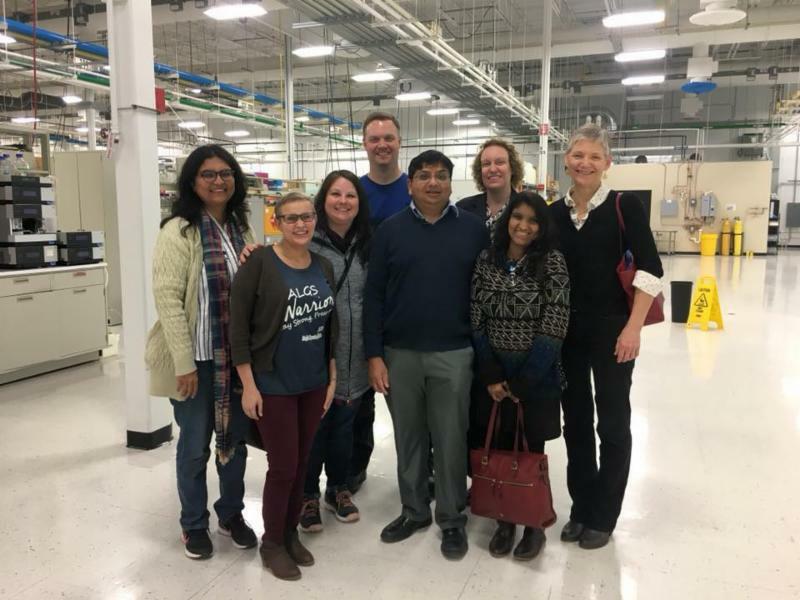 In February 2018, the staff and scientists at Sanford Research welcomed Shamy, Anna, and many members of the Alagille Syndrome Alliance (ALGSA) in what became an unforgetable experience for both organizations. A touching meeting and a renewed sense of hope that one day there may be a cure. 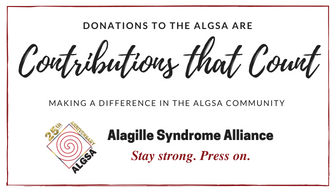 Thanks to critical support from the Alagille Syndrome Alliance (ALGSA) and the Lumena Pay it Forward Project, The Global ALagille Alliance (GALA) Study is officially off the ground— and running. The GALA Study aims to unravel the mysteries of Alagille Syndrome by looking beyond the liver. It will pool patient data from sites around the world to become the main resource for ALGS, addressing critical knowledge gaps, generating meaningful results to inform clinical practice, and shedding light on answers to questions that have perplexed researchers for decades. It will enable researchers to determine the global prevalence, natural history, socio-economic burden, and patient outcomes for ALGS. GALA is, quite simply, a vast one-stop database of patient information that will revolutionize the world’s understanding of this rare and understudied disease. Dr. Binita M. Kamath, a preeminnet and globally recognized expert in pediatric liver disease and a hepatologist at the Hospital for SickKids in Toronto, Canada, is the principle investigator for the GALA Study. 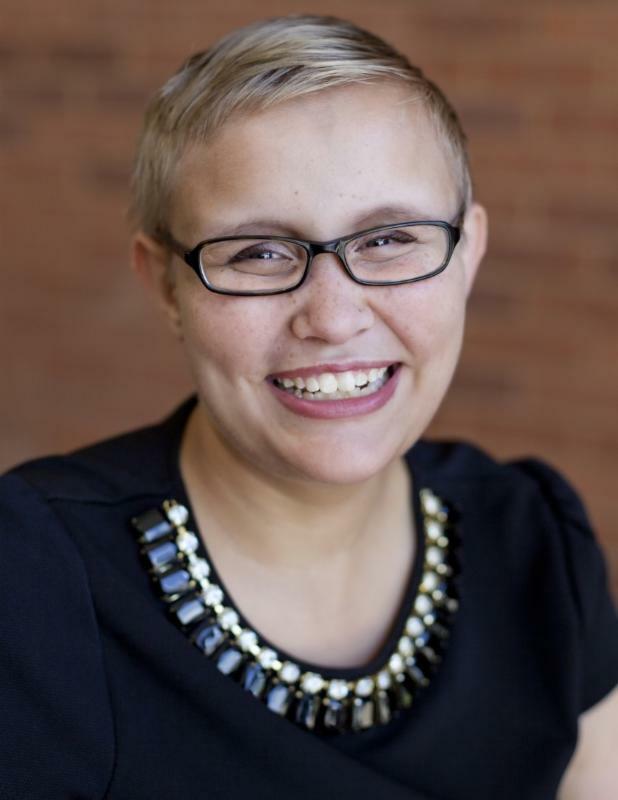 Shannon Vandriel is GALA’s new clinical research manager. Dr. Bettina Hansen, Dr. David Piccoli, Dr. Richard Thompson, Dr. Emmanuel Gonzales, and Dr. Henkjan Verkade to round the scientific advisory committee for the project. To date, 107 investigators in 41 countries have been approached to participate in GALA. Interest so far has been ample and enthusiastic. From the United States to the Czech Republic and Belarus, The Netherlands to China, Kuwait, and New Zealand, investigators are eager to contribute to this monumental effort that will be the bedrock of future research projects on ALGS. The GALA Study is funded for three years, 2017-2019, with over $250,000 raised by the Lumena Pay It Forward Project donors and directed to the ALGSA expressly for this purpose. We are encouraged by the momentum GALA has gathered and excited about the promise it holds for ALGS research. Anyone wanting more information about the GALA Study should contact Shannon Vandriel at gala.study@sickkids.ca . 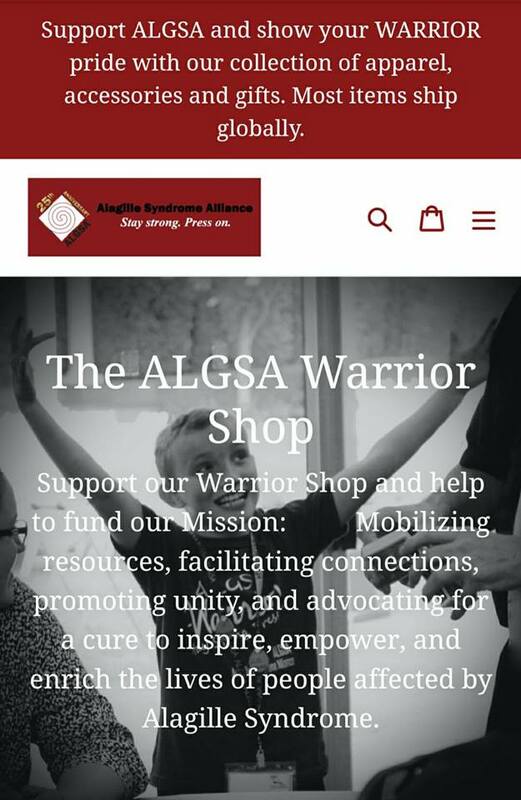 Anyone with questions about the ALGSA’s role in this project or interested in providing financial support should contact Cindy Luxhoj at alagille@alagille.org . with wonderful Warrior Gear and Gifts for all ages! New LOOK, new FEEL, new PRODUCTS! 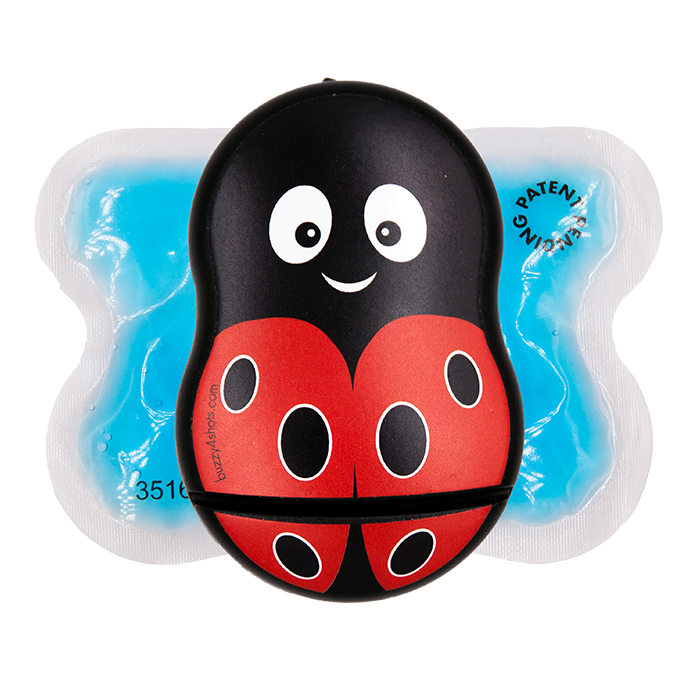 The Alagille Syndrome Alliance was graciously given a coupon code for Buzzy XL products to share with the ALGS community. Amy Baxter, a pediatric emergency doctor, invented a solution to needle pain using ice and high frequency vibration. 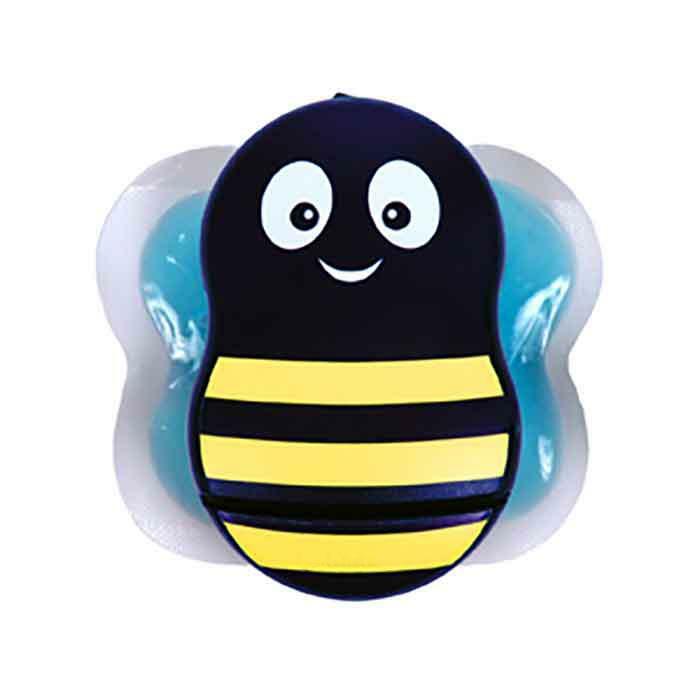 She made it a cute bee, and "Buzzy" has now blocked pain from over 31 million needles - IVF, Lovenox, vaccines, IVs, insulin, Humira. Pain is pain. When people started using Buzzy to avoid opioids after surgery, she quit practicing to make VibraCool wearable pain relief using her patented, clinically proven tech. Her all-woman company is offering the ALGS community an extra 20% off through the month of May on their 20% off XL LadyBuzz or Striped Buzzyunits. This makes all XL Buzzy's 40% off ! Discount available on XL units through May 31 .
by reviewing the ALGSA on GreatNonprofits! It only takes a minute and it's so important to us! Thank you! Click the link to give us a review! 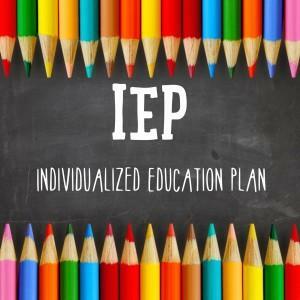 IEP, or Individualized Education Plan ; is an unique, legal document containing information that pertains to the student, with a combination of present levels of skills, parent concerns, educational goals and explanation of special education services to support the child. Some parents may find IEP meetings to be overwhelming, daunting, or even frustrating, but they don’t have to be that way. As a special educator, these are some behind the scene tips that will hopefully ease some of the tension surrounding IEP meetings. It’s not a fight. Please don’t arrive at a meeting ready for a fight. Most educators want to provide a high level of service to their students, and strive to support the growth and development of each child. Listen to the plan, goals and services that the team is presenting. Even if it is not what you originally had in mind, it may work for your student! If you are unhappy, target your frustration to the right place. If you find yourself unsatisfied with your child not being provided specific services or resources, chances are the teacher feels your pain. Their hands may be tied due to lack of funding or service provider availability. Instead of targeting your frustrations to the teacher, try contacting your district board members or even state legislators to fund more access to services in public education. Give a little grace and understanding. At the end of the day, teachers are people too. People make mistakes. Your child’s teacher may have 25+ students to educate, each with individual needs and challenges. On top of that, they go home to their own crazy lives. If your child’s teacher makes a mistake or forgets something, give a little grace and don’t be afraid to remind them. Chances are, they will be extremely grateful for the reminder! Just like with any other profession or situation, there will always be those educators who weren’t cut out to be in this field. If you legitimately have concerns about your child’s education or acquisition of special education services, please follow up with an administrator. As a child growing up with ALGS, I dealt with teasing and bullying from my peers due to being different. Music helped me come to terms with my feelings of negativity, isolation, exclusion, and helped me work through the harshest words said to me. 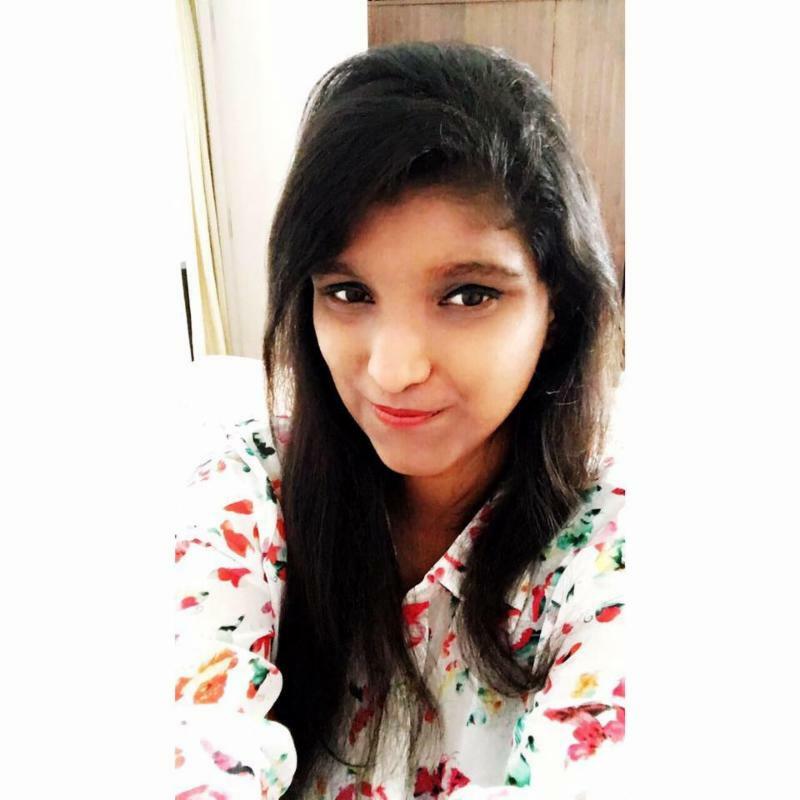 My school experience was very difficult and I had many bad days. With music being quite therapeutic, I could always find a song to relate to every mood. Lyrics and melodies have a way of comforting the worst situations. I’ve come to find that music has made my ALGS journey that much more bearable and feel it was, at times, the only reason I didn’t lose my mind with fears of being crazy, inadequate or worse.....unlovable. It was not uncommon in my house to fall asleep and wake up to music playing in the background. When I couldn’t sleep or when the itching reached its insurmountable peak, my dad would play the great English hits from the 80’s and 90’s. I’ll never forget one day at 5 yrs old and after yet another day of feeling alienated and different from my classmates, my dad drove me to the beach and we sat and listened to great music. He played Mariah Carey’s “Hero” on repeat, making sure I was paying attention to the lyrics. I can still hear the melody in my head and the way it was interspersed with my dad’s voice as he repeated “You see? You see?”. He was, of course, asking me to absorb the power of that song, hoping that it would fortify me with renewed courage to deal with the bullies of the world. I know the lyrics to this song by heart. Today, I still look to Mariah Carey's songs for strength. I imagine her to be my own personal cheerleader, singing songs of encouragement. Many years after the experience with my dad at the beach, my brother made me listen to “Mirror” by Lil Wayne and Bruno Mars when I’d hit yet another low point. The words of that song were etched into my memory in that very moment. Music is an enormous part of my life. It has helped me create courage to fight on, find joy and meaning to live, and to accept the unacceptable. I tried not to run away from my emotions, allowing myself to feel things as deeply as possible, and music lead me through that process. I have many playlists, named according to a feeling and kept available on my iPhone for easy access. The names of my playlists are quirky but effective! I have one titled “Up-Glide”. It includes songs that make me feel light, happy, and like I'm floating away! Music became my outlet for release as a child and more than poetry or anything else, it allows me to deal with the everyday stresses of living a life with ALGS. If you are open to allowing music to fill a void and fill your life, it could be a painless way to process and cope with hardships in life; at least that has been my experience.